Welcome to take two. My first try was really good, I think, but as I wrapped up this post, Blogger didn't feel like saving it. Wish me better luck here. Last weekend, I participated in #edcampGlobal, which despite technical difficulties--all on my end and my fault--I enjoyed it a lot. It was nice to talk about my work with Communities again, and to do so with an audience. It was also a good start to the transition back into the headspace of teaching and the school year. While I love writing about Google Communities and how I use them in my classroom, I've decided to change it up. Instead of writing about the activities and examples that are already in my presentations, I want to bring something new to the conversation. If you're interested in the old stuff, check out my recent post Building and Extending Student Learning and Knowledge with Google Communities or my follow up to Google Education on Air, Teaching and Learning with Google Communities: A #GoogleOnAir Reflection and More. This post also has my GHO embedded if you're interested in more detail. Students share their Published Google Slides presentations introducing aspects of Sophocles' Oedipus, and then I share my notes to compliment theirs. All students have created new resources and used the Community to share their notes and learning with each other. Most of the work in my classroom is written for an audience outside of the student and teacher. I really focused on creating and responding to content this year, and using Google Communities to share student work is one of my favorite ways to do it. I’m a big believer in form following function; that is, all technology should have a clear purpose. For my students, Google Classroom is where students share work with the teacher; Google Communities are where they share work with each other; Twitter, Google Forms, and sharable links are where we share work with the world. After researching 20% Time, students share their resources and summarize their learning. Note the way links and videos are automatically embedded so that all sources are cited. 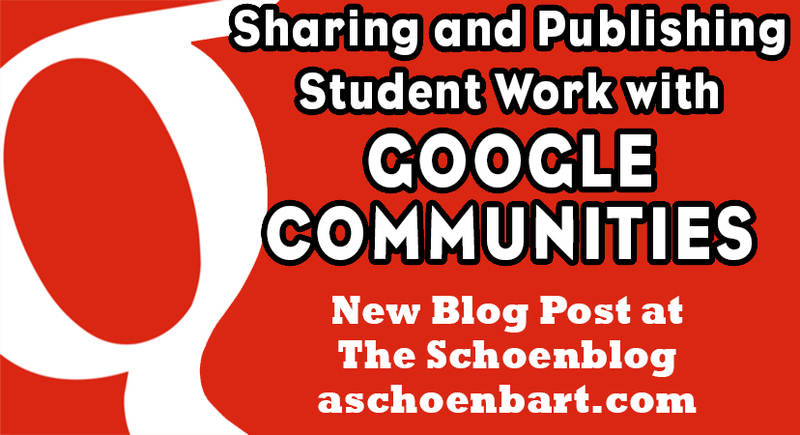 Sharing and publishing student work on Google Communities is easy and effective. Communities automatically, authentically, and intuitively embed multimedia into the stream and make it engaging and clean. You can share links, files from Drive, or even videos from YouTube with just a click or two. This is all part of standard classroom practice for my students--anything we create goes on the Community. Every student has a voice, an audience, and a platform. Every student has a copy of all resources. When students write and publish for an authentic audience, the work is better. Online sharing creates an artifact of your classroom learning. Share it with parents, colleagues, and admin. Reflect on it in a few weeks to begin your planning for the new year. Students filmed argument videos on their smart phones, uploaded them to YouTube, and shared on the Community. Then, they used a Google Form to vote on a winner and evaluate each argument. The screenshots in this post hopefully show how clean and effective integrating links, multimedia, and other resources into Communities can be. My favorite feature Google offers, though, is the Publish to the Web option. I hate nothing more than when students turn in links to Google Slides presentations that let me view the editing pane. I love giving formative and in-progress feedback, but when a product is complete, I have no interest in seeing the editing pane any longer. When it’s time to turn in the product, I want a clean and effective file, complete with playback and animation when applicable. That’s where Publish to the web comes in. On any Google Docs, Sheets, or Slides file, click File → Publish to the web and follow the directions. What this does is creates a new link to your work but converts it into a web site, so that it is now ready to be published and shared. This link is automatically public to anyone you share with; sharing rights of the individual file are superseded by the Published link, but the editing and sharing rights in Drive are unaffected. You can share editing rights with one person, give three people the right to view, and still have the public Published link. The Published version also automatically updates every few minutes to reflect changes to the edited docs. See these examples of a doc and sheet from my classroom. See the difference with these links to my #edcampGlobal presentation. This one is shared in the Google Slides editor so that anyone with the link can view. This one is published--and looks so much better, right? In Communities, if you share the first link, the sharing rights matter. If you share the second, they don’t and the work will be public in its published form. Still following me? Basically, the easiest solution is to change all sharing rights so that anyone with the link can view if you plan to have students share Published work on Communities. This is what I do in my classroom and it works out nicely. Google+ may be on its way out but in my teaching, Communities are here to stay. They are one of the most underutilized and undervalued platforms Google offers and I hope to keep writing about how and why they changed my teaching and my students’ learning for the better. What questions do you have about Google Communities? How do or don’t you use them in your schools? Comment away or find me on Twitter @MrSchoenbart.